A search to find three firefighters missing, presumed dead, after a blaze has begun - an operation which is expected to take up to 36 hours. 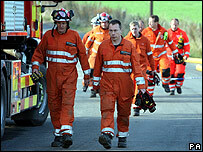 More than 100 fire officers will search for the men in the gutted warehouse in Atherstone on Stour, Warwickshire. Avish Malde, a director of the firm which owns the site, said he believed all workers had got out safely. He also confirmed that there was no sprinkler system installed at the vegetable packing warehouse. A firefighter was confirmed dead after being pulled from Friday night's fire, which is being treated as suspicious. Three of his colleagues remained in the burning premises as the roof collapsed. 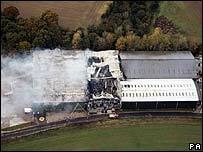 Wealmoor Atherstone Ltd, the company which owns the site, said none of the 300 people it employs at the site are missing. This was confirmed by Mr Malde, who said the fire began at the end of a shift and believed all workers escaped the blaze. It is not known whether fire crews believed more civilians were inside the building when they entered. He also revealed that there was no sprinkler system in place at the warehouse. The director said: "There isn't a fire sprinkler system in place at the moment, but plans were in place to actually put one in. "So at this moment in time we're co-operating fully with the fire services on that line of the inquiry." The specialist teams, from across the UK, started going onto the site on Sunday afternoon. Experts will also be investigating why the crews went into the warehouse while it was still burning. At a news conference on Sunday afternoon, Assistant Chief Officer Jon Hall, of Hereford and Worcester Fire Service, said there was a "36-hour plan to work through the whole building". He said crews would be using heat-seeking equipment and specialist digging equipment to get through the rubble of the building, which he said was still collapsing. Mr Hall said: "It's still moving - we know it's moving, and that's why you'll see monitoring equipment so we know exactly what parts of the building are moving and when. "Particularly in the current weather where it heats up and cools down overnight there's still a lot of movement in that building. It's quite a complex search operation." He added: "The crews always want to do their best but it has an added poignancy when it is their own colleagues they are searching for." The Fire Brigades Union (FBU) said they believed all four were retained firefighters, who work part-time. Sir Ken Knight, the government's chief fire and rescue adviser, described the incident as "harrowing". Warwickshire Fire Service's chaplain Canon David Capron, who is from a family of retained firefighters, said people were converging on nearby Alcester's fire station in tears to express their condolences. He said: "Clearly this has deeply affected the town. It's a close-knit community." He held a service at St Nicholas's Church in Alcester on Sunday morning for the firefighter who had died and those missing. People were seen silently walking into the church holding hands and with bowed heads. Steve McGuirk, president of the Chief Fire Officers' Association, said: "This dreadful incident is a sharp and poignant reminder to us all of the risks faced by our firefighters on a daily basis and that there is no such thing as a routine incident. "Every time our firefighters are called to an incident they put their lives on the line. Thankfully, firefighter deaths in the line of duty are rare and the firefighting community is deeply shocked by this catastrophic event." The incident could be the worst loss of life for on-duty firefighters for more than 30 years. Seven firefighters died in 1972 while fighting a blaze at a warehouse in Kilbirnie Street, Glasgow. 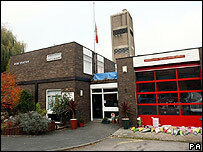 In that incident, one firefighter was trapped inside the building and six of his colleagues died trying to rescue him.